Every dairy producer has faced metabolic disease in their herd. Metabolic diseases are heavily influenced by management; particularly by nutrition through the transition period. As with all diseases, however, a genetic component also exists which means that certain animals are genetically more or less susceptible to metabolic disorders. Starting December 2016, Canadian Dairy Network (CDN) will publish genetic evaluations for Metabolic Disease Resistance (MDR) in the Holstein, Ayrshire and Jersey breeds. With this new tool, producers will be able to select for increased resistance to these costly diseases. Read on to learn more about the development and interpretation of the Metabolic Disease Resistance index and the traits behind it. The impact of ketosis tends to be under predicted on most farms. Clinical ketosis is observed in a visibly ill animal, while subclinical ketosis often remains undetected unless a herd monitoring program is in place. Either form of ketosis leads to excess concentrations of ketones circulating in the bloodstream in early lactation as a result of negative energy balance. Ketosis can lead to other metabolic diseases, impairs immune function and can also lead to reduced reproductive performance, reduced milk production, and an overall increased risk of being culled. In general, higher parity cows experience higher volumes of total lactation milk loss after a ketotic episode. Cows with ketosis are also more likely to experience a displaced abomasum with the majority of cases occurring soon after calving. An accumulation of gas in the abomasum, often caused by inadequate feeding and management, can cause this stomach to move up in the abdomen, generally to the left side of the body. Surgical intervention is often required and cows that have had a displaced abomasum have shown to produce over 300 kg less milk during the lactation. A national system for collecting health events has been in place since 2007. Since that time, approximately 40% of all herds enrolled on milk recording have been voluntarily recording the incidence of eight key diseases and reporting this data to their milk recording agency. This accumulation of data has led to the calculation of genetic evaluations for Mastitis Resistance since August 2014. Effective December 2016, this source of data collection will also be used to produce genetic evaluations for Clinical Ketosis (CK) and Displaced Abomasum (DA). In addition, DHI laboratory analysis of milk samples for levels of BHB (i.e. : milk beta-hydroxybutyrate) serves for calculating genetic evaluations for Subclinical Ketosis (SCK). The overall index for Metabolic Disease Resistance combines evaluations for these traits into a single value for genetic selection to reduce incidence rates in Canadian dairy herds. Metabolic Disease Resistance (MDR) combines evaluations for six traits in total, including Subclinical Ketosis, Clinical Ketosis and Displaced Abomasum, each of which is evaluated separately for cows in first lactation compared to later lactations. To improve the accuracy of these evaluations, the genetic evaluation system also includes two indicator traits, specifically the ratio of fat to protein production in early lactation and the Body Condition Score in first lactation. In general, the relative weight on each trait in MDR is 50% for Subclinical Ketosis and 25% for both Clinical Ketosis and Displaced Abomasum. MDR has an estimated heritability of 7% and evaluations are expressed as Relative Breeding Values (RBV) with a scale that averages 100 and generally ranges from 115 for the best animals to 85 for the worst. For sires, the official status for MDR will be the same as for Subclinical Ketosis in first lactation since this trait will generally have the most daughter information included. Due to the amount of data currently available for these diseases, CDN will publish MDR evaluations only for the Holstein, Ayrshire and Jersey breeds. In addition, genomic evaluations for MDR will only be available for the Holstein breed due to the limited number of reference sires available for Ayrshire and Jersey. Table 1 shows the overall percentage of healthy cows in the three breeds of interest for each metabolic disease. As expected, the incidence of each disease generally increases as cows get older. 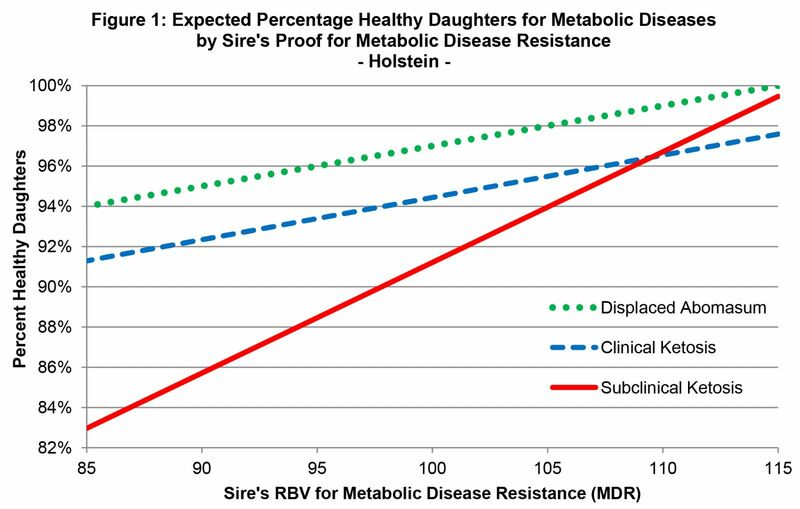 As seen in Figure 1, comparing the percentage healthy daughters for sires that are highly or poorly ranked for MDR clearly shows value in genetic evaluation and selection programs based on this index to improve the resistance to all three metabolic diseases. For Holsteins, a 10-point difference between sires for MDR translates to an expected increase of healthy daughters by 5.5% for subclinical ketosis, 2% for clinical ketosis and 2% for displaced abomasum. Metabolic disease can play a significant role in affecting the profitability of dairy farms. Combining good management practises, especially for cows during the transition period and early lactation, and the Metabolic Disease Resistance (MDR) index for genetic improvement is the ideal approach to minimizing the impact of these diseases in your herd. Given the 20% correlation that MDR has with both Pro$ and LPI some genetic progress has been achieved for these traits but producers now have the opportunity to make direct selection and mating decisions.